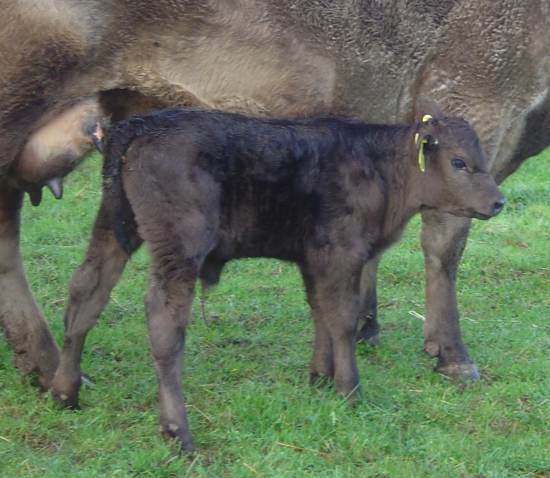 What colour is this calf? The Murray Grey standards say that coat colour can be silver, silver grey, grey, light grey dark grey or black. 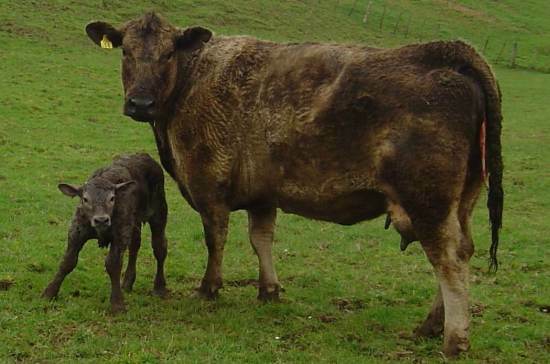 The calving return sheets state to register the colour calf which range in colour from silver through to dark grey as per the Standard, as S, SG, G, LG, G and DG, but does not include black. 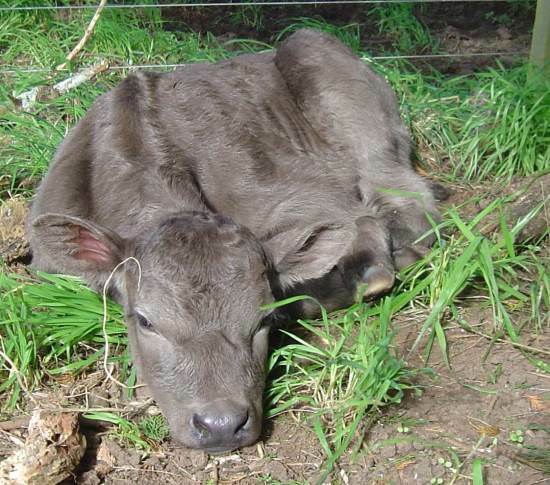 However the NZ registry allows the registration of black calves in the normal register. 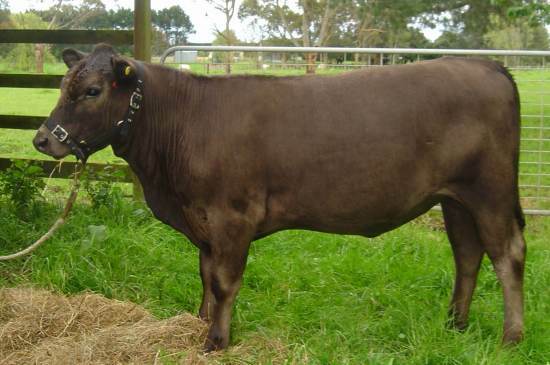 (In Australia there is a separate registry BF or Black factor) so a black calf colour will thus be denoted by B. The word ‘grey’ can confuse as the colour is not grey as in a mix of black and white (often referred to blue in some breeds) but tends to be more a shades of dun, beige and chocolate, tending to the browner shades as the animal gets older. 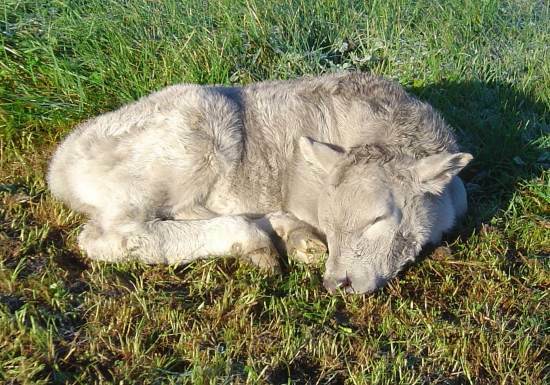 Cows are also often dappled, especially the grey ones, in their summer coats. 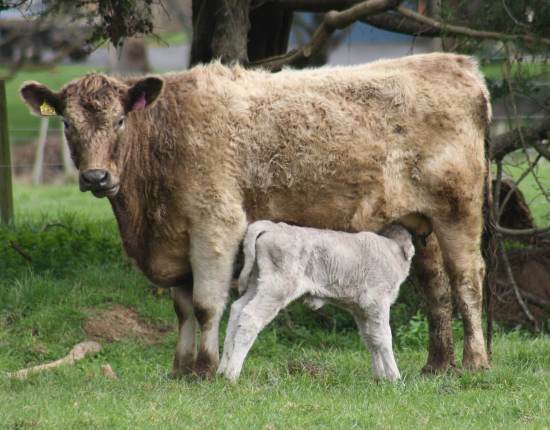 Calves are often born with a grey appearance and these coats then tend to go whiter or browner as they age so it is often hard for the uninitiated to classify a future colour by the initial birth coat. 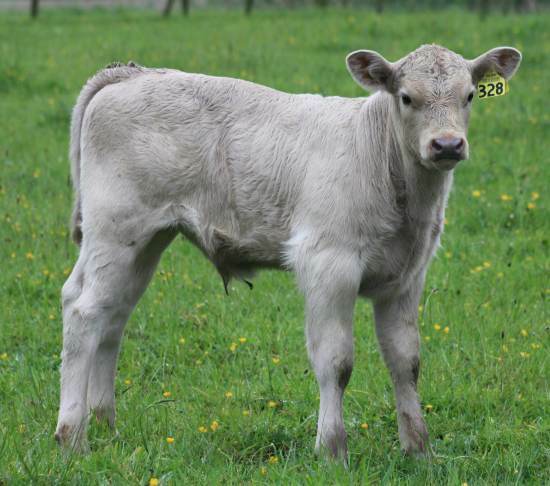 Silver is the lightest colour and is typified by an all over white coat, overlying a dark skin which gives the silver sheen as different to the stark white of a breed like a Charolais or Shorthorn where white hair overlays a pink skin. 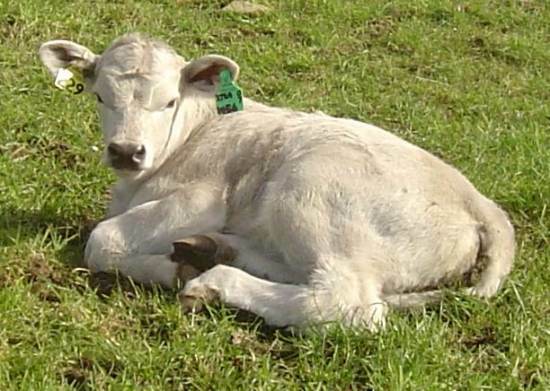 A Silver calf, turns whiter with age. 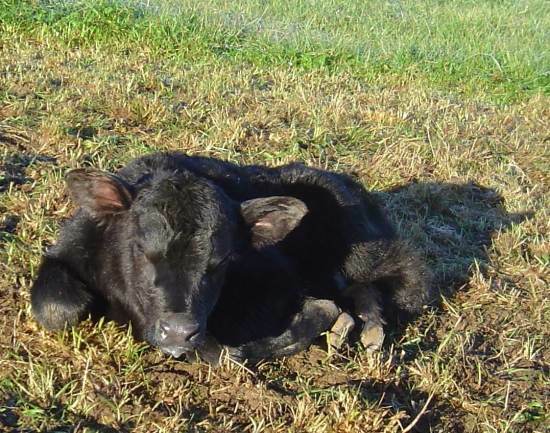 A black calf stays Black! The difference between Silver and Silver Grey is often very subjective and probably the descison comes more with experience knowing how coat colours turn as the sunlight and age turns the initial very soft greys whiter or darker. 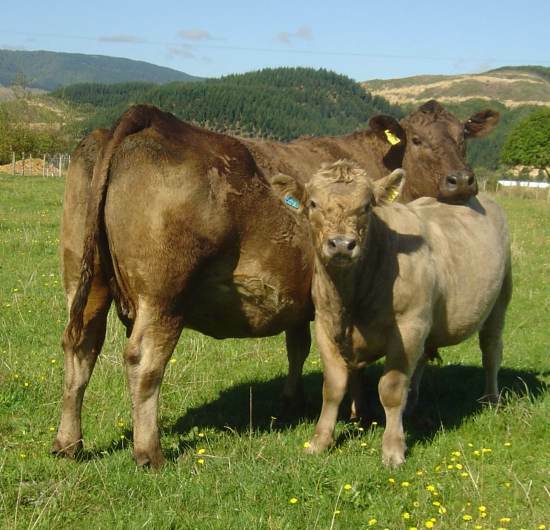 Calves that start out quite grey can end up turning a deep silver grey or honey colour. 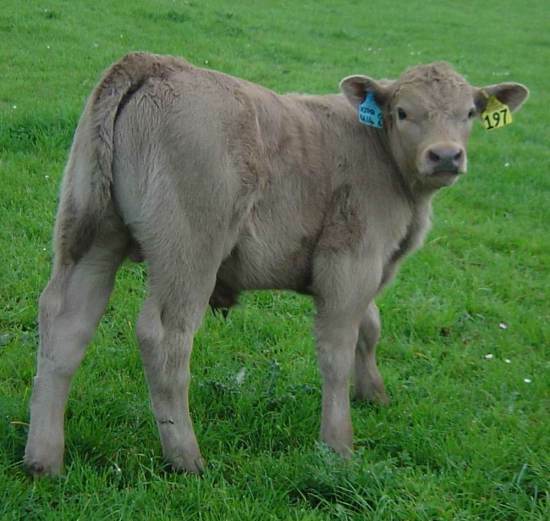 This calf out of a dark grey cow lightened after he dried to Light Grey and by the time he was weaned was dark silver. He was registered as Silver Grey. 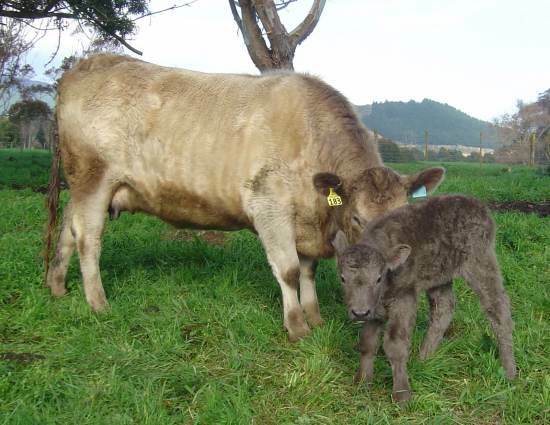 This Grey calf, from a Light Grey cow got paler as she got older. 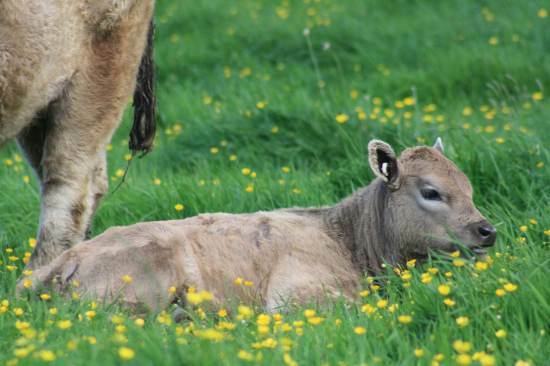 Knowing what shade of grey the calf may eventually become is one thing, but knowing what are the chances of the appearance of the the various colours within a herd is part chance and part due to the genotypes of the parents. Basically there are 3 colours of Murray Greys, Silver, Grey and Black. The base colour is black which has been modified by a diluting gene for silver, which reduces the amount of pigment in the hair. If the animal has one silver gene it appears grey/dun and if it has two dilution genes (one from each parent) it appears white/silver. 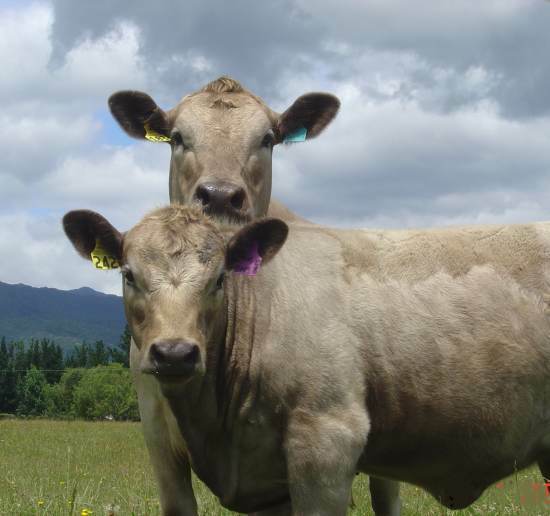 Using pure bred Murray Grey bulls over the following pure bred Murray Grey cows, these are the likely ratio of colours of the calves.